Cereal has been a staple within my diet for as long as I can remember and I’m one of those people who if I can’t decide on what to have to eat I’ll grab a bowl of cereal. I put my love of cereal down to my Granny as she always had a selection of cereals hidden in her sideboard in the hallway which we would sit there for ages trying to decide which one to have today. With a bowl for breakfast and then another bowl about an hour before bed (just to make sure we didn’t wake up craving a midnight snack). I have to admit to going through phases with my cereal eating, sometimes it down to cost but then other times is down to craving a healthier cereal when I am on a health kick for example. 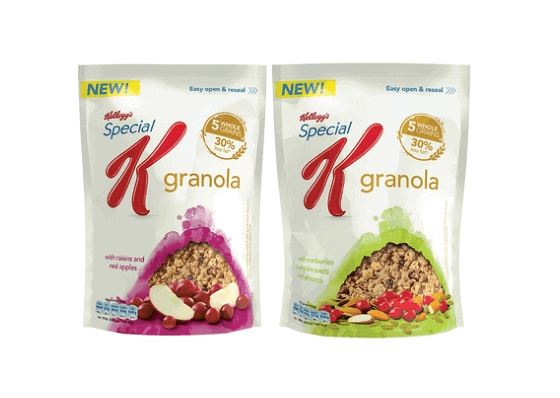 So when Kellogg’s Special K got in touch regarding their new Granola I was happy to give it a go as I quite enjoy a bowl of Special K so hoped that the Granola would add little variety to my cereal selection. It is also fortified with 6 B vitamins and iron and will be available in two juicy varieties: Raisins & Red Apples; and Cranberry, Pumpkin Seeds & Almonds – bursting with real fruit and nut inclusions. As soon as I saw the two flavours available; Raisins and Red Apples and Cranberry and Pumpkin Seeds and Almonds I was excited as they both contain elements that I love. Upon receiving and more importantly taste testing the granola I was not disappointed, I did offer some to Mr Boo and Roo but they weren’t interested (luckily for me!). At 175 kcal per serving a bowl of granola is slightly higher in calories than other cereals however after a bowl full of this you won’t be looking to snack mid-morning and keeps you going all the way up until lunchtime. Now whilst I enjoy a bowl or two of granola it isn’t to everyone taste so I have found myself cooking with it more and more making flapjacks, crunchy oat biscuits and even muffins to encourage Mr Boo and Roo to get some more whole grains in their diets. Disclosure: We received two packs of Kellogg’s Special K Granola FOC for the purpose of review.